How Much Olive Oil to Drink for Good Health? "Drink a glass of olive oil every day," blares a headline on The Conversation's website, promoting a Mediterranean diet. The method was reportedly used by Cretan fishermen in the 1960s who started their day with a glass full of the golden liquid and allegedly enjoyed a long, active life as a result. If you don't feel like tossing back the liquid by the glassful, don't fret; just a tablespoon or two per day is the recommended amount for health, according to ChooseMyPlate.gov. Drinking more olive oil per day than the USDA-recommended daily amount for health can result in adding unnecessary calories to your diet. Why Is Olive Oil Healthy? With decades of hoopla over trying to eat as little fat as possible to prevent heart disease, it might come as a shock that the American Heart Association actually recommends consuming olive oil. The reason is that olive oil contains monounsaturated fat that can reduce bad cholesterol in your blood and help prevent coronary artery disease. Roughly 98 percent of the oil is composed from fats, and this healthy monounsaturated fat made primarily from oleic acid makes up somewhere between 55 and 83 percent of the oil, depending upon the characteristics of each individual batch, such as where it was grown and harvest and storage methods. Find out more about the exact nutrition breakdown of olive oil on MyPlate. Read more: Which Cooking Oil is Best? Other healthful ingredients include polyunsaturated fats in the form of linoleic acid (3.5 to 21 percent) and plant phenols. Although they take up just 2 percent of the oil, there are 230 healing ingredients that include plant phenols, carotenoids and sterols. Studies in 2017 (published in Nutrients) and 2018 (published in Endocrine, Metabolic & Immune Disorders - Drug Targets) show that the shimmery substance not only helps heart disease, but it can also help heal and prevent chronic inflammatory disease as well. The Olive Tap notes on its website that many people in Mediterranean countries drink a quarter cup of extra virgin olive oil (EVOO) each morning, chased by a glass of warm water with lemon juice added. Although ChooseMyPlate.gov recommends total oil intake of no more than 5 to 7 teaspoons per day, there's no scientific evidence that consuming more olive oil is bad for you. 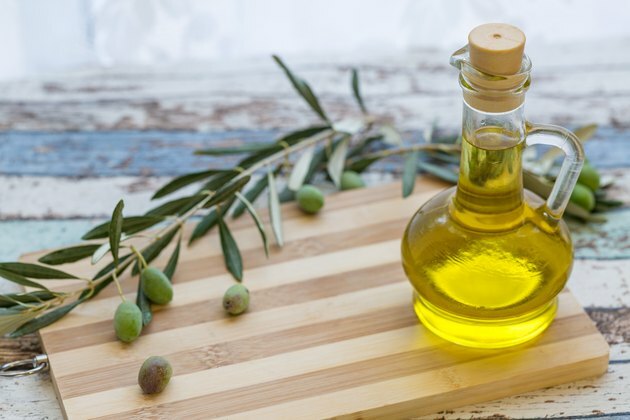 On the contrary, a 2014 study of the Mediterranean diet by BMC Medicine supplemented with olive oil showed that, as participants at risk for coronary artery disease consumed more olive oil, their risk of cardiac events decreased. However, a quarter-cup for a nice, oily breakfast delivers a whopping 477 calories that can rack up unnecessary calories. The Olive Tap suggests that just a tablespoon or two is all you need to reap health benefits that will show up in stronger, shinier hair, nail growth and glowing skin. Talk to your doctor before increasing your intake of olive oil or other fats above the recommended daily allowance, as some oils can trigger side effects or exacerbate health conditions in some people. Olive oil is usually safe according to WebMD, when used as approximately 14 percent of the daily calorie intake, or about 2 tablespoons. The website notes that some people have used far more safely — up to 1 liter per week or just over half a cup per day — for nearly six years. Constipation: Get back in the flow by taking up to 30 mL, or about 2 tablespoons, of olive oil to relieve constipation. Doctor of Physical Therapy Brenda Walding recommends making a morning drink with 2 tablespoons of olive oil added to 4 cups of water and the juice of one lemon. She touts the drink for constipation, cleansing the liver and boosting the body's immune system. Diabetes: Take about 4 teaspoons of olive oil daily to help prevent diabetes. Olive oil has an effect that can reduce blood sugar according to WebMD. High blood pressure: Take 6 to 8 teaspoons per day, recommends WebMD, to assist with high blood pressure. High cholesterol: WebMD's website recommends 2 tablespoons to replace saturated fats in the diet and add 17.5 grams of monounsaturated fatty acids. Although olive oil is generally safe, some people could have mild side effects, such as nausea, from drinking it. If you feel nauseated when taking olive oil straight, try getting your 2 tablespoons by adding it to your cooking or drizzling it on bread. Too much olive oil reduces both blood sugar and blood pressure, so it's possible that if you have trouble with either, you could experience symptoms associated with a sudden drop, after consuming olive oil in your diet. You might not think to consider a dietary staple such as oil as a potential substance that could interact with your medication. However, because olive oil has an effect on reducing blood sugar and blood pressure, it can also affect how your medication works with your body. For example, people taking diabetes medication and consuming olive oil could experience blood sugar that drops too low. Be sure to monitor your blood glucose closely and talk to your doctor about whether your medication dosage needs adjustment. Also, watch out for a drop in blood pressure if you're on medication for high blood pressure and then consume a significant amount of olive oil in your diet. If chugging down tablespoons of slick liquid makes you queasy, there's no need to grimace. It's easy to add olive oil to your diet in other ways. Use olive oil as a dipping sauce for bread. Place it in a shallow dish or saucer, drizzle a little balsamic vinegar on top and sprinkle a little Parmesan cheese overall. Drizzle it over your salad or whip it up in a vinaigrette with balsamic vinegar. Substitute it for butter — you can make it spreadable by cooling it in the refrigerator and whipping it with a hand blender as it starts to solidify to make it creamy. Store in the fridge. What Are the Benefits of Drinking Olive Oil?